It is always best to seek legal assistance shortly after an auto accident occurs in Statesville, NC. An auto accident can happen when you are least expecting it and affect your life in ways you could have never imagined. If you need legal assistance following a car accident in the Statesville, North Carolina area, reach out to me, W. Sloan Goforth, Attorney at Law. I am highly knowledgeable regarding personal injury law and will use this knowledge to your advantage while working on your case. I can take care of all of the legal paperwork and administrative tasks that need to be completed after your car accident, so you can focus on recovering. I will advocate for you throughout the duration of the claims process and take your case to court if the need arises. I realize that the aftermath of many auto accidents is filled with chaos and confusion. When you work with me, I will be here for you to ensure that the legal process is handled with precision and that you are able to receive the compensation that you deserve for your financial, emotional, and physical injuries. Remember, it is always better to seek legal assistance soon after your auto accident occurs, rather than waiting until the claims process is almost over. If you feel that you could benefit from legal assistance following a car accident, give my office a call today to set up your free consultation. 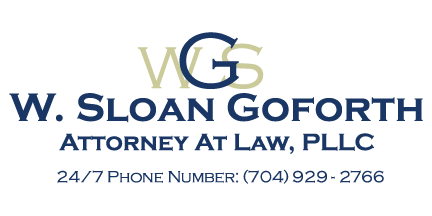 At the office of W. Sloan Goforth, Attorney at Law, we can help with legal cases regarding auto accidents for residents of Statesville, Troutman, Taylorsville, Mocksville, Mooresville, Hickory, Iredell County, Alexander County, and Davie County, North Carolina.